In addition to the annual Ticket Package being offered at midnight on November 23, the Cubs Den Team Store will also offer special Black Friday discounts throughout the month. SOUTH BEND, IN - The holiday shopping season has begun at Four Winds Field. 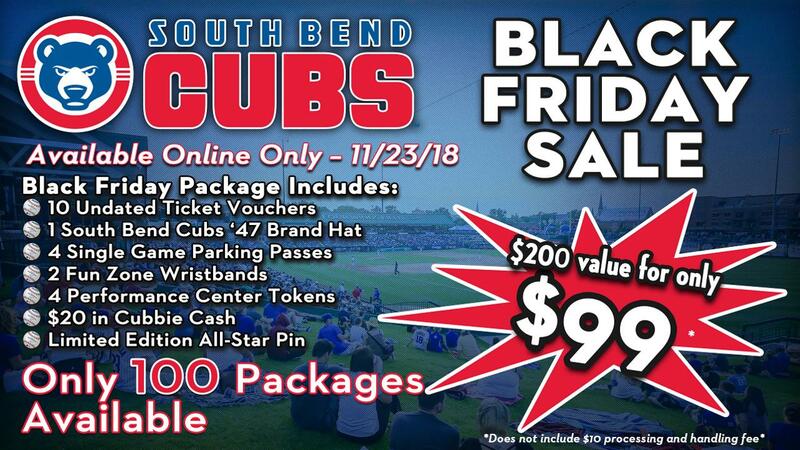 In addition to holiday sales at the Cubs Den Team Store, the first opportunity to purchase tickets for the upcoming South Bend Cubs season will be available on November 23 in the Black Friday Ticket Package. The South Bend Cubs Black Friday Ticket Package includes 10 undated ticket vouchers that can be redeemed for any 2019 regular season game, excludes Fan Fest and the All-Star Game in June. The package also includes a ticket voucher good for any South Bend Cubs '47 Brand hat, four single game parking passes, two Toyota Fun Zone wristbands, four tokens to the 1st Source Bank Performance Center batting cages, and $20 in Cubbie Cash that can be used at the Cubs Den Team Store or Four Winds Field concession stands. Also, for this year only, an exclusive All-Star Game pin will be included. This all-inclusive package, valued over $200, is only $99. Only 100 packages will be available starting at midnight on Friday, November 23. The Cubs Den Team Store holiday sales have already begun as the Cubs Den is currently offering a free $5 gift certificate for every $25 gift certificate purchased. Plus, a limited number of authentic, game-worn jerseys and All-Star Game merchandise are now available. Additional sales will be announced next week on the South Bend Cubs social media platforms. In addition to their sales, the Cubs Den Team Store will have extended store hours for the holidays beginning Monday, November 19, 2018.